Having a wig helps children feel normal at a time when life offers exceptional challenges. Seeing the brave and bald children battling cancer on television inspires many to grow and donate hair for wigs. Since St. Jude Children’s Research Hospital features its little patients in television spots, some want to give hair directly to the hospital. St. Jude can’t turn the hair into wigs, though, so sending it only wastes the gift. To donate hair, Desiree Heide, a specialist at St. Jude’s Child Life Department, recommends donating hair to organizations that take hair for wigs. These organizations then provide the wigs to sick children. Locks of Love provides hairpieces to financially disadvantaged children under 21. Recipients suffer from long-term hair loss, which includes loss caused by cancer radiation therapy. Most of the children helped, though, have alopecia areata. Wigs for Kids targets financially disadvantaged children age 18 or younger. The American Cancer Society endorses this nonprofit because it primarily helps children suffering short-term hair loss caused by cancer treatment. Both organizations ask you to include a donation form with the hair donation. Forms are available at their websites. If donating to Wigs for Kids, hair shouldn’t be highlighted, permed or dyed. 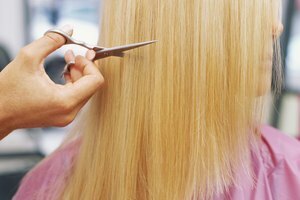 Locks of Love will accept permed or dyed hair, but not highlighted hair. Start with clean, dry hair. Wigs for Kids accepts hair a minimum length of 12 inches. Locks of Love asks for 10-inch lengths and accepts layered hair. Locks of Love: What Is Locks of Love? Johnson, Sophie. "Donating Hair to St. Jude's Hospitals." 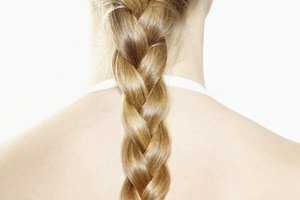 Synonym, https://classroom.synonym.com/donating-hair-to-st-judes-hospitals-12087806.html. 04 October 2017.